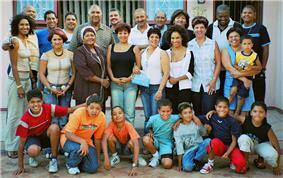 Extended coloured family with roots in Cape Town, Kimberley, and Pretoria. In Southern Africa, the term Coloureds (also known as Bruinmense or Kleurlinge) is an ethnic label for people of mixed ethnic origin who possess ancestry from Europe, Asia, and various Khoisan and Bantu ethnic groups of southern Africa. Not all Coloured people share the same ethnic background. As a result, Coloured people can possess a variety of different features. Besides the extensive combining of these diverse heritages in the Western Cape — in which a distinctive Cape Coloured and affiliated Cape Malay culture developed — in other parts of Southern Africa, their development has usually been the result of the meeting of two distinct groups. Genetic studies suggest the group has the highest levels of mixed ancestry in the world. However, the maternal (female) contribution to the Coloured population, measured by mitochondrial DNA studies, was found to come mostly from the Khoisan population. The origins of the Coloured community stems from numerous interracial sexual unions between Western European males and Khoisan females in the Cape Colony from the 17th century onwards. In KwaZulu-Natal, most Coloureds come from British and Zulu heritage, while Zimbabwean Coloureds come from Shona or Ndebele mixing with British and Afrikaner settlers. Griqua, on the other hand, are descendants of Khoisan and Afrikaner Trekboers. Despite these major differences, the fact that they draw parentage from more than one naturalised racial group means that they are coloured in the southern African context. Such people did not necessarily self-identify this way; some preferred to call themselves black or Khoisan or just South African. The history of racial segregation and labelling in South Africa and neighbouring countries has meant that the governments placed all such mixed race people in a certain relationship together. The imperial and apartheid governments categorized them as Coloureds. In addition, other ethnic groups also traditionally viewed them as a separate group. Coloured people are made up of Malaysian, mixed race and people from khoisan ancestry. Khoisans, mixed race and malaysians were classified as 'coloured' by the Apartheid government combining them together as one. Cape muslims are also 'coloured' and have malaysian, indoesian and black ancestry as many indonesian slaves intermarried with african partners. Not all coloured people have the same ancestry. Many Griqua began to self-identify as Coloureds during the apartheid era. There were certain advantages in becoming classified as Coloured. For example, Coloureds did not have to carry a dompas (an identity document designed to limit the movements of the non-white populace), while the Griqua, who were seen as an indigenous African group, did. Coloured people constitute a plurality of the population in the Western Cape (48.8%) and a large minority in the Northern Cape (40.3%) and Eastern Cape (8.3%) provinces. Most speak Afrikaans, while about twenty percent of Coloureds speak English as their mother tongue, mostly in the Eastern Cape and KwaZulu-Natal. However, virtually all Cape Town Coloureds are bilingual. Some can comfortably codeswitch between Kaapse taal (a creolized dialect of Afrikaans spoken mostly in the Cape Flats) and suiwer Afrikaans (formal Afrikaans as used in schools and media), and South African English. This genetic admixture appears to be gender-biased, with a majority of maternal genetic material being of Khoisan origin, which means that the origin of the Coloured population predominantly is the result of European and African males encountering autochthonous Khoisan females. Coloured people played an important role in the struggle against apartheid and its predecessor policies. The Abdullah Abdurahman rallied Coloured political efforts for many years. Many Coloured people later joined the African National Congress and the United Democratic Front. Whether in these organisations or others, many Coloured people were active in the fight against apartheid. The political rights of Coloured people varied by location and over time. In the 19th century they theoretically had similar rights to Whites in the Cape Colony (though income and property qualifications affected them disproportionately.) In the Transvaal Republic or the Orange Free State, they had few rights. Coloured members were elected to Cape Town's municipal authority (including, for many years, Abdurahman). The establishment of the Union of South Africa gave Coloured people the franchise, although by 1930 they were restricted to electing White representatives. They conducted frequent voting boycotts in protest. This may have helped the election of the National Party in 1948, as their apartheid programme intended to strip Coloured people of their remaining voting powers. Coloured people were also subject to forced relocation. For instance, the government relocated Coloured from the urban Cape Town areas of District Six, which was later bulldozed. Other areas also include Constantia, Claremont, Simon's Town. Inhabitants were moved to racially designated sections of the metropolitan area on the Cape Flats. Additionally, under apartheid, Coloured people received educations inferior to that of Whites, It was however, better than that provided to Black South Africans. J. G. Strijdom, known as the Lion of the North, worked to restrict Coloured rights. He removed their ability to exercise their franchise. Strijdom's government expanded the Senate's numbers from 48 to 89. All of the additional 41 members hailed from the National Party. It increased its representation in the Senate to 77 in total. The Appellate Division Quorum Bill increased the number of judges necessary for constitutional decisions in the Appeal Court from five to eleven. Strijdom, knowing that he had his two-thirds majority, held a joint sitting of parliament in May 1956. The entrenchment clause regarding the Coloured vote, known as the South African Act, was amended. Coloureds were placed on a separate voters' roll, which could elect four whites to represent them in the House of Assembly. Two whites would be elected to the Cape Provincial Council, and the governor general could appoint one senator. There was a great deal of opposition, both black and white, to this. The Torch Commando was very prominent, while the Black Sash (white women, uniformly dressed, standing on street corners with placards) also made themselves heard. The 1964 Coloured Persons Representative Council turned out to be a constitutional hitch which never really got going. In 1969, the Coloureds elected forty onto the council to supplement the twenty nominated by the government, taking the total number to sixty. During the 1994 all-race elections, many Coloured people voted for the white National Party, which had formerly oppressed them. The National Party recast itself as the New National Party, partly to attract non-White voters. This political alliance, often perplexing to outsiders, has sometimes been explained in terms of the common Afrikaans language of White and Coloured New National Party members, opposition to affirmative action programmes that might give preference to non-Coloured Black people, or old privileges (e.g., municipal jobs) that Coloured people feared giving up under African National Congress leadership. Since then, Coloured identity politics has continued to be important in the Western Cape, particularly for opposition parties. They see the Western Cape, in particular, as a place where they might gain ground against the dominant African National Congress. The Democratic Alliance drew in some former New National Party voters and won considerable Coloured support. The New National Party collapsed in the 2004 elections. 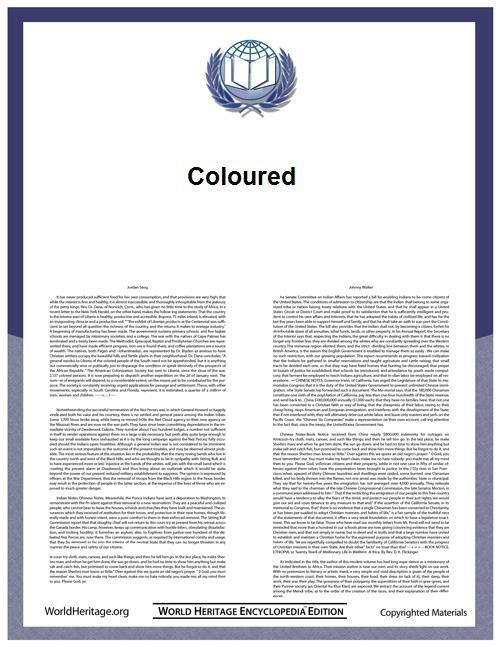 Coloured support aided the Democratic Alliance's victory in the 2006 Cape Town municipal elections. Patricia de Lille, mayor of Cape Town and founder of the Independent Democrats, does not use the label Coloured to describe herself but would be considered a Coloured person by many. The Independent Democrats party sought the Coloured vote and gained significant ground in the municipal and local elections in 2006, particularly in districts with heavily Coloured constituencies in the Western Cape. The firebrand Peter Marais (formerly a provincial leader of the New National Party) has also sought to portray his New Labour Party as the political voice for Coloured people. There has been substantial Coloured support for and membership in the African National Congress before, during and after the apartheid era: Ebrahim Rasool (previously Western Cape premier), Dipuo Peters, Beatrice Marshoff, Manne Dipico, John Schuurman and Allan Hendrickse have been noteworthy Coloured politicians affiliated with the African National Congress. The Democratic Alliance won control over the Western Cape during the 2009 National and Provincial Elections and has since brokered an alliance with the Independent Democrats. The Congress has had some success in winning Coloured votes, particularly among labour-affiliated and middle-class Coloured voters. Some Coloureds express distrust of the ANC with the comment, "not white enough under apartheid, and not black enough under the ANC." In the 2004 election, voter apathy was high in historically Coloured areas. According to the Christian Science Monitor, around four in 100 South African marriages occur between members of South Africa's major ethnoracial groups, with trepidation toward interracial marriage polling far lower among black South Africans than among white South Africans. It is not known how many descendants of post-apartheid interracial relationships identify as Coloured or with the Coloured minority group. The term Coloured is also used to describe persons of mixed race in Namibia, to refer to those of part Khoisan, part white descent. The Basters of Namibia constitute a separate ethnic group that are sometimes considered a sub-group of the Coloured population of that country. Under South African rule, the policies and laws of apartheid were extended to what was then called South West Africa, and the treatment of Namibian Coloureds was comparable to that of South African Coloureds. The term Coloured or Goffal is also used in Zimbabwe, where, unlike South Africa and Namibia, most people of mixed race have African and European ancestry, being descended from the offspring of European men and Shona and Ndebele women; however some Coloured families descended from male Coloured migrants from South Africa who married local women. Under white minority rule in Rhodesia, Coloureds had more privileges than black Africans, including full voting rights, but still faced serious discrimination. The term Coloured is also used in Swaziland. The American English term (spelled as colored) had a related but different meaning. It was primarily used to refer to people of African descent, except in the state of Asian, Native American and African descent. In Great Britain, coloured has also been used to refer to anyone who could not describe themselves as white. ^ a b c d e f g h i j k l m n o p q r "The Coloured people group are reported in 17 countries". Retrieved 25 December 2014. ^ "Statistical Release P0302: Mid-year population estimates, 2011" (PDF). Statistics South Africa. 27 July 2011. p. 3. Retrieved 2011-08-01. ^ "coloured". Oxford Dictioneries. Oxford University. Retrieved 14 April 2014. ^ "What’s in a name? Racial categorisations under apartheid and their afterlife" (PDF). Archived from  Not all coloured people have the same ancestry. Each one is different and mixed with different ancestry. 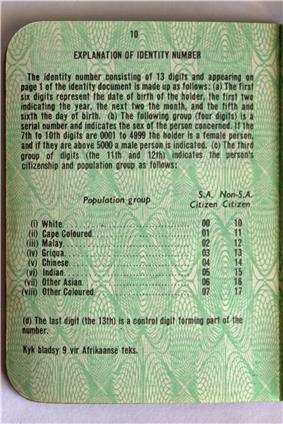 Many people lost their identity during Colonialism and Apartheid. the original] (PDF) on 2006-06-23. ^ Schmid, Randolph E. (April 30, 2009). "Africans have world's greatest genetic variation". Msnbc.com. Retrieved 2009-10-23. ^ Tishkoff SA, Reed FA, Friedlaender FR; et al. (April 2009). "The Genetic Structure and History of Africans and African Americans". Science 324 (5930): 1035–44. ^ a b c Quintana-Murci, L; Harmant, C; H, Quach; Balanovsky, O; Zaporozhchenko, V; Bormans, C; van Helden, PD,; et al. (2010). "Strong maternal Khoisan contribution to the South African coloured population: a case of gender-biased admixture. American Journal of Human Genetics 86: 611-20.". ^ a b c Schlebusch, CM; Naidoo, T; Soodyall, H (2009). "SNaPshot minisequencing to resolve mitochondrial macro-haplogroups found in Africa. Electrophoresis 30: 3657-64". ^ "doi:10.1016/j.langsci.2004.10.002" (PDF). Retrieved 2013-07-01. ^ "Genome-wide analysis of the structure of the South African Coloured Population in the Western Cape". Human Genetics. August 2010. Retrieved 2014-01-29. ^ Faull, Jonathan (June 21, 2004). "Election Synopsis - How the West was Won (and Lost) - May 2004". Institute for Democracy in Africa. Retrieved 2009-10-23.